Second shot is usually blind, onto green. Water on left side of green. Large sand trap on right side. Water is on right side of fairway, approaching the green. There is a large ash tree on the left side, and two sand traps protecting the green. Partially hidden green from tee-off. Pot sand trap on the fairway to right. Figure eight sand trap in front of green. Sand trap to left of green. Landing area for first shot is 165 yards. Sharp dog-leg to right. Poplar trees on right and water in front protect green. Small dog-leg. Water on right side of fairway at approximately 250 yards. Water on left side of fairway at approximately 150 yards in front of green. Sand traps on right side of fairway at approximately 140 yards in front of green. Horse shoe shaped green with a sand trap in front, back and right side. Pond on left side of fairway at approximately 180 yards. Birch trees between green and the pond. A second pond is 20 yards in front of green. Sand trap on right side of green. Large green protected by water directly in front and continues to back of green. Fairway is hidden by hill, 100 yards in front of tee-off. 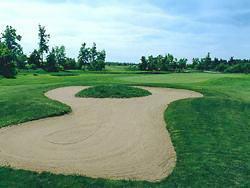 Green is protected by three sand traps – front and both sides. Gully in front of green. Mixture of trees at back of green. This is the shortest hole on the course. "Over the river" play. Two sand traps in front of green. "Over the river" play. Pond approximately 275 yards from tee-off. Sand trap on right side of fairway near green. 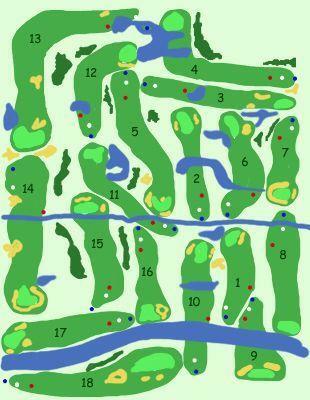 Sand trap on the left and right side of green. Green slopes towards water at back. Dog-leg to the right. Water to the right of green and fairway. Sand trap on right side of fairway at approximately 200 yards. Sand traps on both sides of green. Green is hidden by pine and birch trees on right side of fairway. Pot sand trap on fairway on right. Sand trap on left of fairway, approaching green. Saucer shaped green. Sand trap right hand side of green. Water at back of green. This is the shortest par 5 on the course. Sharp dog-leg. 165 yards to landing area from first shot. Water on right and front of green. Sand trap on left of green. Longest par 5 on the course. Ditch at 195 yards from tee. Sand trap on right side of fairway approximately 400 yards from tee. Pond on left side of fairway is approximately 100 yards in front of green. Raised green surrounded by sand trap on three sides. Front is open. Sand trap to the right of fairway. 220 yards from tee off. Sand trap on the right and back of raised green. This is one of the easier holes on the course. Large sand trap on left side of green. There is a mixture of trees on right side. Green sloping away from area of play. Play is "beside" river with a gully in front of green. Sand trap on right, left and front of green. Play is "beside" river. This is one of the most difficult holes on the course. Large green with sand trap in front of green and two sand traps on right side of green.